Greetings! Long time no see! 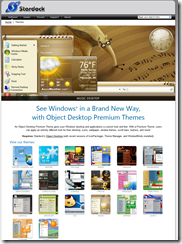 So what’s going on with Object Desktop these days? The answer: A lot. Much of what we’ve worked on for the past year hasn’t gotten communicated very well to our consumers and I apologize for that. As some of you may know, we sold Impulse to Gamestop last year. A lot of people couldn’t believe that we would sell our most profitable business unit. But I suspect some of you will understand why. It was consuming us. In another year, Stardock would have been Impulse and little else. And if money were the only purpose in life, maybe that would be a good thing. But Stardockians want to make cool stuff, not put all our time into selling other people’s stuff no matter how cool it is. That isn’t to say we haven’t been able to release some really cool stuff in the past couple of years. Fences was recently regarded as the “best. program. ever.” by CNET. WindowFX 4, DeskScapes 3 upped the ante and while not part of Object Desktop, ObjectDock 2 came out this past year. And there have been updates to WindowBlinds, SkinStudio, IconPackager and Theme Manager in recent times to keep building on their success. At this stage in the development of desktop enhancements, we have to make some tough choices. The #1 slow down to our development cycles has been trying to get things to run on Windows XP, Windows Vista, Windows Vista 64, Windows 7, and Windows 7 64. And we are already developing for Windows 8 as well which is, in itself, a pretty significant departure. So on the one hand, customers want new stuff and lots of updates but on the other hand they want their OS supported and we just don’t have the manpower to do that. Back in the Windows XP days, we could crank out a ton of cool stuff. Now, we have to worry about whether certain system DLLs will be available on Windows 7 “Ultimate” vs. Windows 7 “Home” or whether they were taken out entirely after Windows Vista Business. Desktop Enhancements: Fun times. Of course, in the old days, I was around to keep everyone in the loop on this stuff. For a lot of our long-time customers, it’s not the slow down in new programs but the lack of communication. Hence, the hidden cost of the focus on Impulse for the last couple of years. Our most radical new program is called Tiles. There’s an early beta of it on Object Desktop right now. It’s designed to enable users to manage their tasks in “pages” of tiles that represent what they’re currently working on or will be working on. In the old days, we made virtual desktops. That made sense when we were all running on individual, low resolution monitors. But today and into the future, high resolution, multiple monitor setups are how power users work and what they need are things that let them make full use of that. That is the purpose of Tiles. In a similar vein, we’re working on a new program that will let you more effectively switch between running tasks via your keyboard. Microsoft and Apple have each tried their hand with this but we have felt they spent too much effort in making it demo well versus being a practical tool. And let’s face it, Alt-Tab is starting to get pretty long in the tooth. 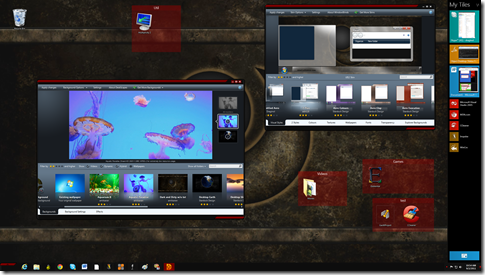 WindowFX 4 was a significant departure from the old “special effects” concept of WindowFX. That was because on Windows Vista, all those cool DWM effects were not hardware accelerated (Microsoft wasn’t hardware accelerating a lot of things in Windows Vista and had deprecated GDI+ and at first had removed hardware acceleration). But in more recent times, hardware acceleration has returned, particularly in Windows 7’s DWM. This has meant we can start adding lots of cool effects. DeskScapes is continuing to evolve as we prepare for the day of letting pretty much everyone make their own dynamic content for it. The idea is to make it so that the desktop background isn’t limited to being pretty but can be made into a useful area. There’s not a lot to tell (publicly anyway) as a lot of work involved with Windows 8 that we can’t discuss. There’s been screenshots of Fences 2 floating around. We have no ETAs on it yet as seeing what is (and isn’t) doable on Windows 8 is taking up some time. But there’s a lot of interesting new features in the works including letting users define a directory as a Fence as well as having Fence “pages”. We’ve had a hard time with Windows 7 folders and we’re not sure if this is going to be cured in Windows 8. If it’s not, we may make changing the default folders of Windows 7/Windows 8 become a “hidden” (i.e. off by default, unsupported) feature. Not so much a secret but rather we haven’t come up with a name for it yet. It’s a program for skinning the new Windows 8 immersion UI. Same thing, not secret but a program that takes some of the non “FX” parts of WindowFX and graduates them to their own program. I don’t have a lot of good news to report on this. The effort in making it work well on all these versions of Windows is not going well at all. We are still deciding its future. Theme Manager 4 has become our preferred method of applying suites. We killed MyColors entirely. So over the coming months you’ll see a lot of of the MyColors themes become Theme Manager .suite files. We are looking at updating CursorFX to support the DWM but it is still in the planning stages as we’re not sure the demand vs. cost of this yet. This is more an area where we need to bring in more developers. We’re hiring btw. If you’re a great developer you can even work from remote. Some… a lot of programs are not going to make the cut. One decision we have made is that if we can’t make it work on Windows 8, it’s dead. That doesn’t mean we won’t still have it available but we won’t be doing updates for it anymore. Another decision is that we will be ending support for Windows XP pretty soon. We haven’t decided a date but what it means is that after that date, we won’t be testing on Windows XP anymore on new releases. So a program may work…or it may not. The same is true with Windows Vista. It’s absolutely murdering us trying to support all these OSes. 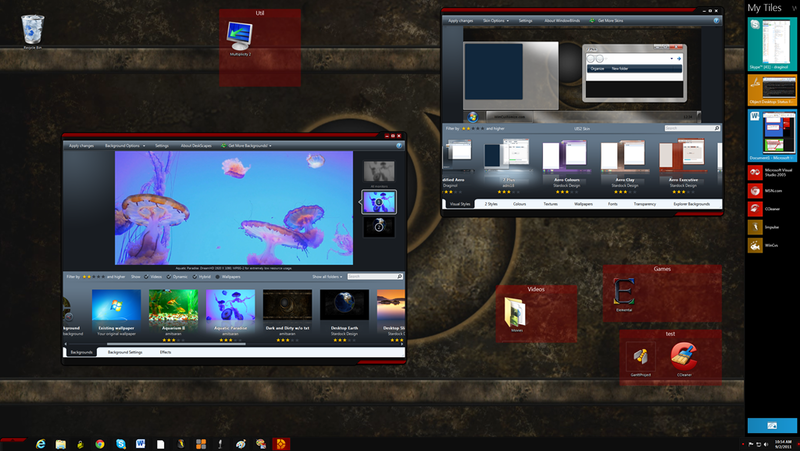 RightClick, TweakVista, Virtual Desktops, LogonStudio, BootSkin, MyColors, ObjectBar, Keyboard LaunchPad. They’re still available but we won’t be supporting or updating them. There will be a revamp to WinCustomize 2012. It will be more evolutionary than revolutionary. The main area will be performance and new features rather than a whole new look or something. DS4 sounds extremely interesting and so does WFX5. That is good news. I've long muttered that Win 7 was the first OS that Microsoft actually made....all before it were just 'experiments'. Assuming 8 is anywhere as good as 7 then it's seriously time everyone started looking 'forward' rather than backward. 7 is a bloody good OS ...possibly the best anyone has managed to date - on any platform. This article was just what I was hoping you'd do, Brad. Very happy about the W8 news! Just where I was hoping SD would go. People there must have been laughing at my suggestions, though. I'd say the only real disappointment for me is DX. Please try hard for DX. Please. It's a truly great program with tremendous power!!! The newer apps all sound excellent, as do the plans for WC. Jafo : THERE we are on the same line. 7 is the best OS MS EVER made. And Thanks Brad for this long awaited Update. I really hope, there us a chance for DX. And I hope for a fix of the incomptibilities of Multiplicity and CursorFX. As a fresh update for MPC ist just out I guess it will be developed futther on also ? I think it would be nice to have some idea how Win 8 is going to change windowblinds skinning. I've already had nightmares about it. What I clearly don't want is staring at pastel unicolored or the least gradient tiles all over my desktop. That one I could already do in the Year 2000 with DesktopX... The whole metro design is s good idea for the phone (although I curse myself for taking a windows phone with my contract), but not for my desktop. Also the start menu that slipped through in some videos is plain ugly. It also pleases me that Tiles is skinnable. Wish more folks would do Tiles skinning. How popular has tiles been? I personally couldn't adjust to it. Not been on here a lot, work has taken over my free time, and life has not allowed me the time/energy to work on things like i used to. But also, the lack of any kind of fixes on DX has also put a major damper on things. I dont want DX4 as much as i want dx3.x to work. I put in a bug report in may, and have had 2 updates, 1, we got it. 2, someone will look at it. There are so many things that DX does well, but its the bugs the kill ya. Some of these could be solved but i know that $ is a major issue. I understand completly, thus the reason i have not been on here pushing it. Its potential is insane, its just that the cold facts are there are so few people developing things for it that even if you made a new update and charged $100 for every PRO user out there.. you might make 5k, maybe. I love DX, always have. I had hoped there would be fixes (years ago), but i saw the writing on the wall for this a long time ago. I wish you could at least look at the biggest bugs and see how hard they would be to fix, and the hell with new stuff. Then get some people making some cool new stuff (what that is i have no idea), and promote it as a tool for school kids learning programming. Can you imagine a DX PRogramming class in a local school? teaching them the basics of programming, and allowing them a place here to show off their work, to the world?? COOL. No mater what i have to hand it to you for DX, it was a much under used, and under valued product. Those of us that have spent (MAJOR) time programming for it know part of its true potential. Best of luck all the updates. You are an amazing person to know that life is more then $, most people never get that. I wish you nothing but the best! I know the option to skin tiles is there but the option to use the current WBs is also. Given a choice I think most folks will take the easy way, not that I am most folks. Another decision is that we will be ending support for Windows XP pretty soon. We haven’t decided a date but what it means is that after that date, we won’t be testing on Windows XP anymore on new releases. So a program may work…or it may not. The same is true with Windows Vista. It’s absolutely murdering us trying to support all these OSes. Given this, what will be the requirement in future regarding OSes to be compulsorily skinned for saleable Masterskins? But... think about the folks who don't have ODNT and don't know about WC, yet could use the functionality of Tiles, just like Fences...and not know that skinning Tiles is possible and easy. Skinning for them would bring many more to WC and expose them to the other programs... and to skinning. Programs like Tiles, Fences, Carousel, Program X and Y can be more than just apps...they can be "Portals".... and opportunities to bring people here. Thanks for this, Brad. Can't wait to see what W8 brings. Good to have an idea of how things look going forward, thanks for the update. Tiles is still in beta. There are a few must-have features IMO to make it worthwhile that we're working on (and that are tough to do). For example, I need to be able to drag and drop URL links to a page and when I click on those links for them to switch to specific active tiles on that page. Same for documents. Similarly, I need to be able to drag a window that has a document (or URL open) to a Tiles page and have it create an active tile (which it does) but once I close it it needs to become an inactive tile (short-cut to program with document/url). The problem is that Windows only stores the caption (title bar text). Not the path to the document. So we can't get that information to and from Windows. We know what we *want* to do. Build in .NET (or Python) scripting support and use the DWM as our means of getting stuff done. Frankly, we need Windows to become a more reliable development platform again like it was during the days of Win32 and GDI. I shoudl write up more on this topic. There's still so much up in the air about Windows 8, I guess literally time will tell. 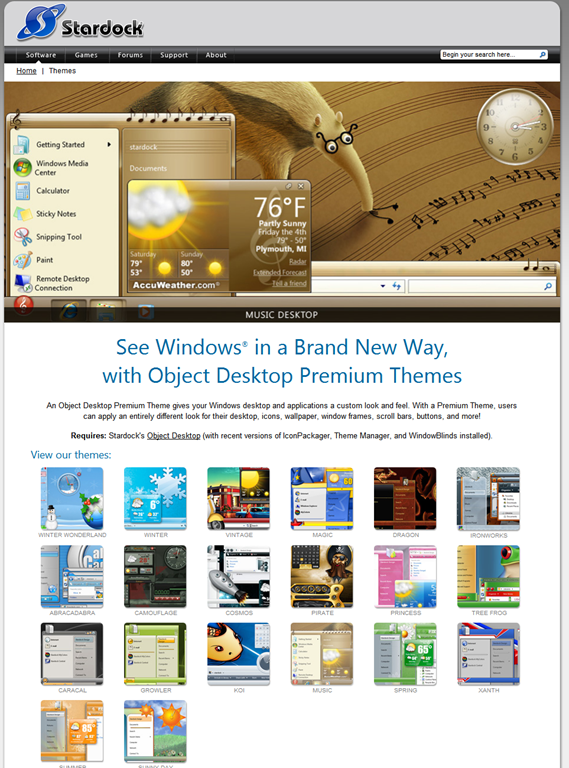 If they are going to bring mini-apps back to the desktop, I wonder if that would be a good direction for DX to go in. I wouldn't bet on .NET as it seems MS is moving away from it.